Light and airy luxury executive golf course home located on prestigious Fairway Road. Air conditioned bedrooms, humidification and air cleaning system throughout. In walking/biking distance to world famous Sun Valley Resort with its tennis and swimming, golf and nordic lodge, Symphony Pavilion, Sun Valley summer ice shows, Writer's Conference, Dollar and Bald Mountain ski areas and the shops, restaurants and entertainment in Ketchum. Built in 2000, this 5600 sq. ft. home has floor to ceiling windows and French doors with stunning views of the Bald Mountain ski area and the world's first chairlift above the golf course on Rudd Mountain. Easy access to Proctor Mountain trails. On the main floor, the expansive granite countertop kitchen opens on both sides to the living, dining and family room areas, making it ideal for multiple gourmet cooks and interaction with family and friends. There is a fireplace in the living room and one in the dining area, a large indoor BBQ, multiple dishwashers, ovens and sinks and a widescreen TV. There are three window seat, game and eating areas, with comfortable table seating for twenty. A large mudroom/laundry room for all the outdoor gear opens onto the outdoor hot tub and sauna entrance. Outdoors are extensive patio, flower bed and lawn areas, a fenced backyard with a dog door for small, non-allergenic pets, and complete privacy, yet views of the golf course fairway and green. A basketball hoop is located in front on heated pavers. Upstairs, there is a large, private master suite with a king bed, fireplace, reading and study areas, marble bathroom with expansive his and her vanities and closets, soaking tub and glass shower. Adjacent up half a level is a large den/office with fireplace, convertible bed, TV, and stunning views of Bald Mountain. The junior master guest suite has a king bed, Jacuzzi tub, glass shower and Bald Mountain views. Adjacent is a large two bedroom suite with a queen, double and twin with a shared bathroom with a shower. There is ample area for private reading, work and game playing throughout. Central air (upstairs only), three heating zones, central humidifier and air cleaner, stereo system upstairs and down, three TV's, DVD, cable TV, phone/intercom system, wireless internet. Designed and built this home to provide the ultimate in entertaining options. Indoors and outdoors blend through the floor to ceiling windows and doors, providing light, views and access to outdoor living spaces in all directions. Walk or bike to Sun Valley Resort and Ketchum. Ultimate privacy and quiet yet close to all amenities, including tennis, golf and hiking trails on Proctor Mountain. Located on Sun Valley Resort Golf course, within walking and biking distance to all resort amenities including the Olympic pool. Discounts and reserved times available for golf and tennis. 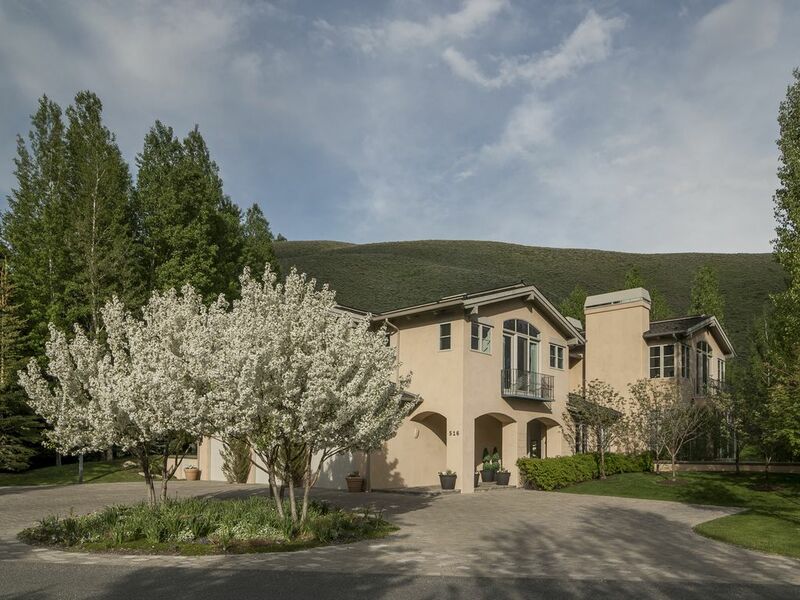 Located on 14th (recently remarked to the 16th) fairway on Sun Valley Resort's renowned and scenic golf course. Expansive distant views of Bald Mountain and of the world's first chairlift on Rudd Mountain immediately behind the house. Two zones for bedrooms. Whole house humidification system with air cleaner. WiFi is installed in the home and connected to the cable service. Two ovens, microwave, two dishwashers, three sinks, large indoor bbq, Cuisinart, Kitchenaid mixer. Patios and lawn fronting on golf course fairway screened with mature trees. Available at Sun Valley Resort. Nike tennis camp. 45 holes available at Sun Valley Resort. House is on the 16th fairway of the Trail Creek Course with view of the green. Avoid the traffic for the Summer Symphony and Sun Valley ice shows. Walk to Trail Creek or the Sun Valley Club for lunch. Hike out the door up Trail Creek, Proctor Mountain and beyond. My family stayed in this lovely home for multiple weeks in August 2018. Fairway Road is a top location in Sun Valley--convenient to the Sun Valley amenities, Ketchum, Elkhorn, hiking, biking, and all the activities the area offers. We enjoyed using the pool and spa at the Sun Valley Lodge and the close proximity to Proctor Mountain and hiking trails. The backyard has amazing golf course and mountain views and was perfect for our family to relax and BBQ. Joan is easy to work with and went the extra mile to make sure we had a wonderful stay. The home offers a great laundry room/mud room, perfect for fishing gear in the summer, and skis/boots in the winter. An excellent home for our multi-generational family trip to Sun Valley. Great location and comfortable luxury home for enjoying activities in the Sun Valley and Ketchum area. Well designed home provides private bedrooms and perfect larger connected rooms for entertaining and cooking with a group. The open concept kitchen is the heart of the main floor with dining, formal living and family rooms all adjoining the gourmet kitchen. Well appointed with plenty of everything to make your stay relaxing and fun. The owner is responsive and great at getting back to you if you need anything or have a question. Large lot backs up to a green belt for privacy and gorgeous views. Near Golf, tennis, hiking, fitness club, biking, shops, Olympic Pool, and terrific restaurants and cultural events. We will be back!! My family of skiers has rented this beautiful property for many years during the snowy season. The owners have thought of every detail for a luxury home and to accommodate the snow sports--heated garage, large laundry/mud room with storage for boots, wet clothes, hot tub, sauna, etc. The heart of the home is a deluxe kitchen with several work areas so your group can all cook and entertain together. There are formal areas and very comfortable casual seating--all with gorgeous views to the mountains and golf course. The master suite is serene with lovely views, a gas fireplace, window seating and a large bath and dressing area. The floor plan is perfect for extended families or groups, although my husband and I have even stayed here alone and loved it. The owner is a delightful hostess who communicates quickly if you have questions. This wonderful property has been the venue of choice for every trip our active family, and sometimes just my wife and I, have made to Sun Valley for the last seven or eight years. We are a family of experienced travelers, and know this beautiful, luxurious, comfortable and welcoming home will be the perfect place to return to ski, play tennis, run, fish, ride, hike, ice skate or just relax. The property is always maintained perfectly, and accommodates us, no matter our family’s and guests’ individual and varied pursuits or the season. For Winter, there are two wood burning fireplaces in the main living areas on the ground floor, a huge kitchen with everything (including an indoor BBQ), a sauna, hot tub, triple-bay heated garage with plenty of room to store skis and other sports paraphernalia, a very large mud room/laundry room for boots, parkas, gloves and helmets, and wet gear. For Spring through Fall, there is a beautiful, private patio with outdoor fireplace, with a view to the fairway and the Idaho sagebrush hills beyond. The owner has provided every detail for this luxury home. The great kitchen, with numerous work areas (including four sinks and, I repeat, an indoor BBQ), is one of our favorite details as it has more than enough room for all chefs, “wannabee” chefs, helpers and guests to appropriate their own space and interact comfortably. There are formal areas, a huge dining area (with fireplace), and other areas with comfortable, casual seating. The ground floor and the upstairs bedrooms all have great mountain and golf course views. From the owner’s suite (with gas fireplace and seating areas), from the VIP bedroom, and from the “office” (with its gas fireplace, built in desk, and fold out bed), one can see “Baldy” and “Dollar” mountains. Two additional bedrooms upstairs have views to the hills. The layout of the house works just great. We have never had a problem or concern while at the property. When we have had questions or asked for information about local events or amenities, the owner has been quick to respond with extensive and insightful information. I recommend you book this property – except when we want to be here!